Before the racing, let’s start with the track. It was disgraceful. With more jumps than Daytona and less speed, they made it more of a hybrid outdoor supercross track than a GP motocross track. It made Qatar the week before look like a natural circuit! Shaun Simpson described the circuit as ‘strange’ and not up to GP standards, while an angry Julien Lieber felt the track designer thought he was designing a track for a computer game. Kevin Strijbos had already questioned the track builder’s ability to understand the difference between supercross and motocross on the Friday before he had even rode the circuit! Antonio Cairoli also felt the track was too dangerous as did many others including championship leader Max Nagl , who admitted he took not risks because he just wanted to get through the weekend safe. Nagl finished seventh overall and dropped to third in the points. The biggest frustration was the fact the last two GPs in Thailand had been at a superb circuit that had everything that you wanted in a motocross track, then for some reason it got changed to a different location and a terrible track. Maybe the only guy who liked it, or at least didn’t hate it, was overall winner Ryan Villopoto. The American legend won his first ever GP on the jump filled circuit and dominated the GP all weekend until the final moto. On the Saturday Villopoto was quickest in free practice, second in timed and blitzed the qualifying heat by 30 seconds. Villopoto admitted the track suited him and he didn’t initially appear to be having the same problems with the humidity after being based in Florida for a number of years. They couldn’t have made a better track for RV to bounce back on after his disastrous debut in Qatar. He was on fire and no-one could stay with him. Villopoto predictably won the first moto on Sunday by ten seconds and looked odds on to win moto two. But then Antonio Cairoli suddenly turned up and walked away with it! The Italian had been off the pace all weekend, (similar to RV in Qatar) but somehow pulled a holeshot and won the final moto of the day against everyone’s expectations. Cairoli put in his fastest lap of the weekend in the final moto – that is pretty impressive, beat Desalle by ten seconds and Villopto by 22. It was a big mental boost for the Italian to win when Villopoto was on fire. Cairoli then explained that he didn’t like the track as it had too many jumps, was too tiny and too dangerous. He also mentioned and that is still behind the level of speed and conditioning he expects to be at later in the season. But this was a big win because Cairoli just showed everyone, including the doubters, that he has the stuff to win against an on-form Villopoto on a track that doesn’t suit his style. Clement Desalle was maybe the biggest winner on the weekend. He had another two brilliant seconds to claim the points’ lead and is quietly becoming the man to beat for the championship so far this season. Four second places in a row has given him a nine point lead in the series and Desalle has the red plate for the first time since 2013. This is the best start to the season Desalle has ever had and he is a very real contender for this championship, speed isn’t an issue, he just needs to stay away from injury. But in the end it was Ryan Villopoto’s day as he became the first American since Zach Osborne in 2009 to win a Grand Prix and the first American since Kevin Windham at Budds Creedk in 1999 to a GP in the main class! It was a great way to rebound from the disappointment in Qatar and I have a feeling it won’t be nearly ten years until the next the next time the US anthem is played on the GP podium with RV on this form! But that second moto visibly shocked Villopoto, he understandably did not expect (neither did anyone else) Desalle and Cairoli to pull away from him after he had been so much faster the entire weekend. But Villopoto is a realist and a champion, he gave props to both guys for their performance and admitted he didn’t have anything for them in race two so settled for third and the overall. RV is now up to fourth in the championship, 18 points behind the championship leader Desalle, and is in the hunt for this title. Gautier Paulin went 7-6 for sixth overall and on paper it looks like he was off the pace. But he actually rode great! Paulin crashed twice in race one and then had to come from outside the top twenty in race two so like Villopoto last week, he did a good job of salvaging points and was riding well on the Honda. But Paulin can’t afford many more of these type of days, althought he is only three points behind VIllopoto in the championship so is still in the hunt and hasn’t showed his best form yet. It was a terrible day for Jeremy Van Horebeek, the Yamaha man hated the track and crashed in race one and had to pull off due to blurred vision after hitting his head. He raced the second moto, and was running in the top five when he had to pull off again. Van Horebeek is now well out of championship contention and will be pretty angry in Argentina at round three. Annoyingly for Van Horebeek his teammate and MX2 rookie Romain Febvre is having a brilliant start to the season. Fourth overall in Thailand and tied for fifth in the championship just three points off RV shows just how strong Febvre has been on the Yamaha. The kid has a lot of potential and is only in his third year of GP racing. He will only get faster! Poor Tommy Searle. The Brit was injured in Qatar and damaged nerves in his thumb but was feeling a bit better in Thailand. At least until he crashed hard over the finish line jump in the first moto and ended up with a compressed vertebrae in his back. It has been a nightmare season for Searle, made even more frustrating because he has shown the speed to run at the front in the practice sessions. In MX2 Jeffrey Herlings won despite being sick during race one and nearly fainting after the race with the heat! Herlings recovered in time for race two and won again. But for his challengers it was a nightmare. Tim Gajser got third in race one after challenging Herlings early. But he needed medical attention after the race and wasn’t allowed to race second moto! That destroyed his challenge for the title and has pushed Gajser back to eighth in the championship. However Gajser is starting to find his form and he could well challenge Herlings for race wins as the season goes on. Suzuki’s Jeremy Seewer fell off just before the finish line on the last lap of the first moto and fainted, again he wasn’t allowed to race the second race. But the biggest story again was Jordi Tixier. Again Tixier was fast, but he isn’t getting the starts and had to work through the field. He fell off on the last lap of race one due to tiredness in the same place as Seewer and was too exhausted to keep going. He had to get an IV and apparently ended up punching the doctor and FI official, when he couldn’t race moto two. The rumor is that Tixier is now banned from Argentina and has a 5000 Euro fine for his actions. 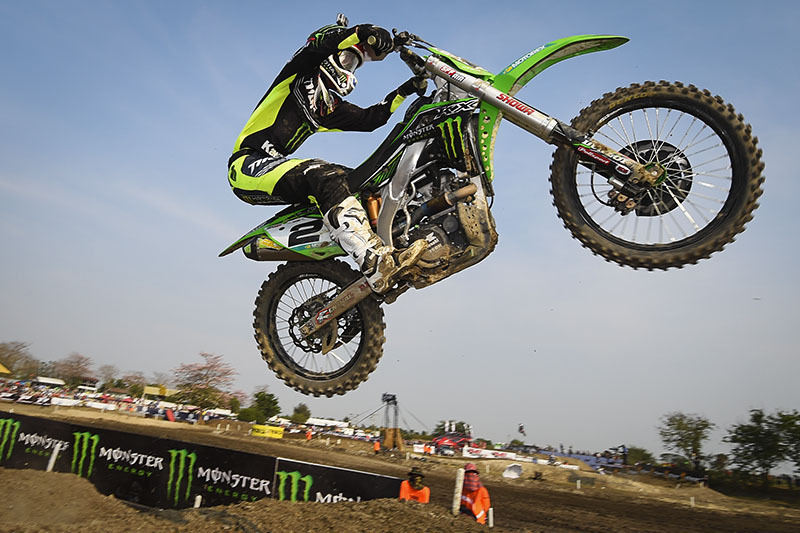 Tixier has had a complete nightmare start to the defence of his title despite riding well at both rounds. Hopefully the Frenchman can recover from the heat and get back to getting the results he is capable of when the series returns to Europe. Dylan Ferrandis rode well for third overall to stay in touch with Herlings in the championship and already is the only other rider close enough in points to challenge the Dutchman with Gajser and Tixier out of contention after race two in Thailand. Pauls Jonass made it a KTM 1-2 and got Latvia’s best ever GP result. The teenager has really stepped up from last season and in Thailand coped with the heat pretty well too. Jonass is really showing his true potential and is putting himself in contention with Ferrandis, Gajser, Tixier and Lieber for regular podiums. The work with Everts is paying dividends and Jonass is one to watch, KTM look to have made another brilliant signing. Julien Lieber has been another revelation in 2015, The Belgian was running third in race one before a horrible crash over the bars while jumping onto a big table-top. How he wasn’t injured was a miracle and Lieber came back to finish third in race two! It was the best GP ever for Thomas Covington. The American ran well in both motos for fourth overall with the jumpy nature of the track suiting his style perfectly. This will be a big confidence boost for Covington who will be hoping to maintain these results in Argentina and the tracks all over Europe. So the circus now heads to Argentina in three weeks, another new track but this time it looks pretty good, slightly sandy and circuit that everyone should enjoy. A lot of MXGP riders haven’t shown their potential yet and everyone will be hoping to improve for round three. We might start to get a better picture of how it’s going to go then! MXGP Championship: 1. Clement Desalle (BEL, SUZ), 88 points; 2. Antonio Cairoli (ITA, KTM), 79 p.; 3. Maximilian Nagl (GER, HUS), 78 p.; 4. Ryan Villopoto (USA, KAW), 70 p.; 5. Romain Febvre (FRA, YAM), 67 p.; 6. Gautier Paulin (FRA, HON), 67 p.; 7. Kevin Strijbos (BEL, SUZ), 55 p.; 8. Evgeny Bobryshev (RUS, HON), 45 p.; 9. Todd Waters (AUS, HUS), 40 p.; 10. Shaun Simpson (GBR, KTM), 38 p.